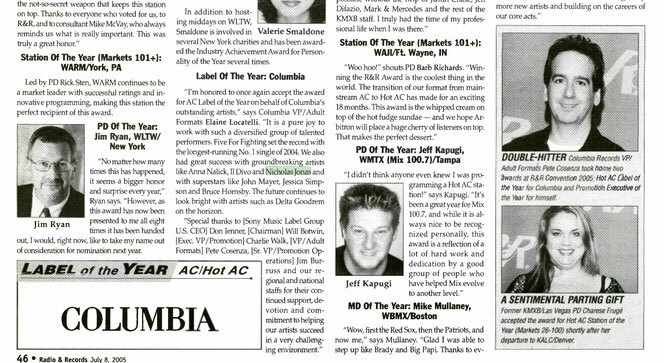 2005 articles - NJB JimdoPage! CMP: Where do you live? NICHOLAS JONAS: I live 45 minutes away from New York. CMP: How long have you been singing, acting, dancing and everything? NICHOLAS JONAS: About four years now. I've been in a couple commercials. I did a Chuck E Cheese commercial, a Disney Channel commercial, and I've been in four Broadway shows. CMP: What made you decide you wanted to start doing that? NICHOLAS JONAS: I've always loved to do it. At the age of 2, I was at my grandma's house and I went into the kitchen and grabbed the turkey baster. I walked into the living room, got up on the coffee table and started singing. My grandma said, "You can't be up there, you're going to hurt yourself!" And I said, "No, I have to practice! I'm going to be on Broadway." That's when it all started and I was 2. I guess the Lord always had it on my heart to do it. CMP: What was the very first acting or singing thing you did? NICHOLAS JONAS: It was a little industrial film for the Sony stores. Now I'm signed to Sony music and INO. So it's pretty crazy because that was the first thing I did and it's also what I'm doing now. After that, I did "A Christmas Carol," and then "Annie Get Your Gun" with Reba McEntire, "Beauty and the Beast" and "Les Miserables" in the final cast, when it closed. CMP: How did you get the role in your first Broadway show? NICHOLAS JONAS: Well, in this business, you have to have a manager. One day I was in a barbershop at the age of 6. I was with my mom and I just started singing. Somebody in there heard me and said, "You should really talk to a manager. My son is in 'Les Mis.'" So we went to this manager and she signed us and after that, she sent us out on some auditions and I got "A Christmas Carol." I was 7, so it was pretty cool how that worked out. CMP: How old are you? NICHOLAS JONAS: I'm 12. My birthday is September 16. CMP: What made you want to make a Christian record? NICHOLAS JONAS: My love for the Lord. Listen to this: there's this Broadway Cares foundation for women with cancer and they put a little CD out every year with Christmas songs from all the Broadway shows on it. They asked me if I would do a song on it and my dad asked if we could write a song. They said yes, so we wrote a song called "Joy to the World/A Christmas Prayer." And someone at Sony music heard it from our chiropractor, who knew the guy who owned INO records, Jeff Moseley. He sent it out to him and then he sent it to radio to see what would happen, to see if people would like it. We got great response from a lot of people just calling and saying they heard the song on K-LOVE or all these radio, so the whole thing just worked out perfectly. CMP: What was your favorite part about making the album? NICHOLAS JONAS: The studio work was really fun. We'd be in the studio every day from 12 p.m. to 12 a.m. People would laugh when I would say, "I have a job," but I really did. It was cool; I loved being able to go from the Broadway stuff to the recording stuff. It was cool to see how they put the CDs together. Now I'm like a recording whiz. I know everything about recording stuff. People will be talking to me about (a producer) and I'll be like, "Oh, they probably used Pro Tools." It's funny. CMP: You got to work with your family members on the album, too, right? NICHOLAS JONAS: Yeah, that was really awesome. I actually have three brothers. I have a 15-year-old brother, a 17-year-old brother and a 4-year-old brother. So the two older ones, we did four songs on the record together. We wrote eight out of the 11 songs, either with my dad or mom or co-writers, and it was really fun to work with them. CMP: Do you have a favorite song on the album? NICHOLAS JONAS: If I had to choose one, there's a song called "Time For Me to Fly," which will be the first single. It's about how everyday we have these pressures and all these things we have to do, and if we just give it up to the Lord, He'll let us fly. CMP: Is there any specific group of people you hope your album will reach? Or any message you specifically want to get across? NICHOLAS JONAS: The Word of God says to reach everybody, so that's what I really want to do. I'm just excited I'm able to use the gift the Lord has given me. Just like Samuel, at such a young age, says, "Speak, for your servant heareth." I want my music to encourage people and let people see the light. My life verse is Matthew 5:14: "A city on a hill cannot be hidden." My motto is to be a light. That's what I want my message to be. CMP: Can you tell me about the foundation you started? 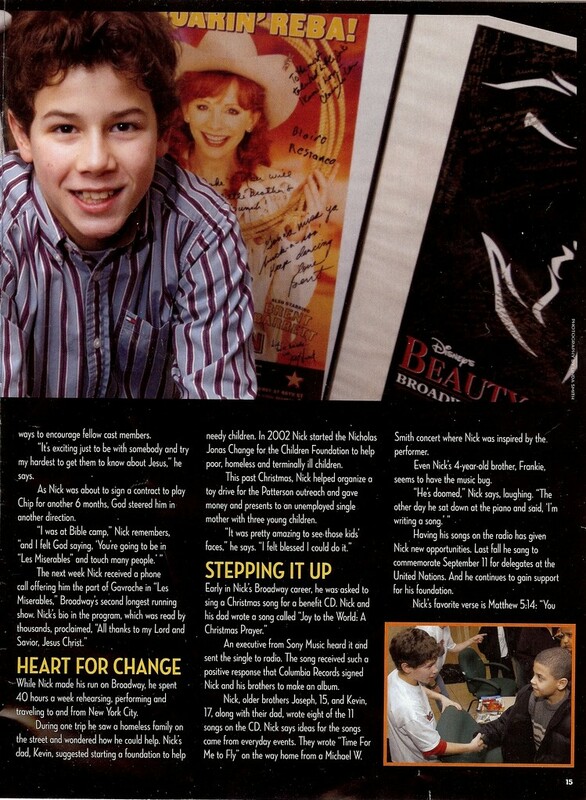 NICHOLAS JONAS: It's the Nicholas Jonas Change for the Children Foundation. It all started one day when I was driving through the city with my dad. I saw a homeless family and I said, "Dad, what am I doing to help them?" He said, "Well, you give money to the church, you tithe, you help people." And I said, "No Dad, I mean with my talent." He said, "Well, do you want to do something for them? Maybe start a foundation or something?" And I said, "Yeah, Dad, that would be great. Let's try to work on that." So that's how it all came about. From then on, we helped children whose home burned down and we just recently helped a family who has nothing for Christmas this season and a single mom. I feel blessed I'm able to do it. "I know exactly when boy bands will be over," said Lou Pearlman, the Svengali behind Backstreet Boys, 'NSYNC and O-Town. "When God stops making little girls." While he gives props to the new breed, he warns that the five-year cycle of boy-band boom-and-bust is coming round again — so don't get too attached to that My Chemical Romance leather wristband. So is a new golden age of boy bands right around the corner? Even though Backstreet's on its way back, co-manager Johnny Wright is hedging his bets. He recently signed a precocious family band he's thinking of calling Sons of Jonas, which is led by 12-year-old songwriter/singer Nicholas Jonas. "When Backstreet started with that Max Martin sound, it became the teen sound with Britney and 'NSYNC. Then Avril came out with a more rock sound, and now it's these garage bands that are the new face of teen music," Wright said. "But a pretty face isn't all it takes anymore. Fans understand now and can't be force-fed a formula." Thus, his young, cute new band will play positive music that Wright says is similar in vibe to Maroon 5 but has Switchfoot's righteous lyrical content. So I went to church last night. It was supposed to be one of those special Saturday services, because we had this guy named Kevin Jonas with us. For I think the many of us who are not familiar with him, he’s the guy who wrote the song “Come As A Mighty River”. According to him, he has been worship leading for over 30 years and recorded some albums with Christ For The Nations Institute. He is currently the Senior Pastor of Wyckoff Assembly Of God, New Jersey. The list of songs that he has written includes “I Still Have The Dream” which he co-wrote with Michael W. Smith in the Dove Award-winning album This Is Your Time (quite a nice album it was too). He came down to KL three years ago and I was there for one of his worship concerts. I had totally forgotten who he was until he started singing “I’ve Got The Joy” and taught us the actions that came with it. Alas, my memory was refreshed. You see, while he was away, I was promoting the song in cell group and CF. It’s quite catchy and a fun song to do too. I was listening to Kevin Jonas describe his family. After saying how beautiful his wife was and that his kids were handsome because of her, he started naming his children from the eldest: Kevin (17), Joseph (15), Nicholas (12) and the youngest is 4. Then he went on to say that his three elder boys have been on commercials, musicals and Broadway. And then, something clicked. 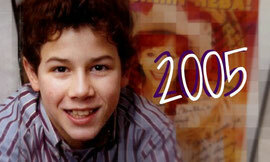 6 months ago, I typed up a blog entry about a kid named Nicholas Jonas. This remarkable 12-year old has also been on Broadway countless times, including Les Miserables and Beauty and the Beast. Go ahead. Make the connection: Kevin Jonas, the worship leader who dropped by SIB KL and led last night’s service is Nicholas Jonas’ father. How cool is that? In a short moment of ‘starstruck’ness, I went up to Kevin Jonas after service and confirmed it with him. My hunches were indeed correct, so I said “I’m a fan of his” (now this was looking more like a meet-the-fans session) and asked him to send my regards and best wishes. I mean, dude, you just met the father of the kid you blogged about! That’s about the closest you’ll get in your lifetime, probably. I wish he brought his son’s album with him. Oh well. Here’s the icing on the cake. Nicholas Jonas, together with his two older brothers, have signed a recording contract with Sony. “They’re a boy band,” their father says, rather jokingly. The band name? Sons Of Jonas. You’ll be able to hear more from the brothers once the album is released. For now, its just a website. This morning’s memorial communion service is to honor those in the Fellowship who have gone to be with the Lord during the biennium. The service begins at 9:30 a.m. in the Colorado Convention Center Lecture Hall. The pre-service and service will feature a variety of performances from celebrated musical artists. Nicholas Jonas will also perform in prelude to the service. 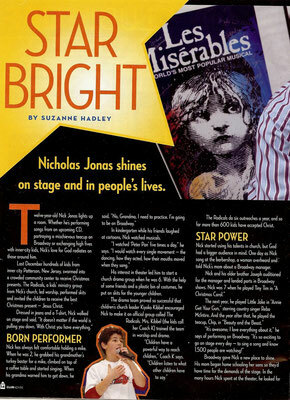 At just 12 years old, this talented singer, dancer, songwriter and actor has already starred in four Broadway shows, several commercials and a variety of recorded works. Jonas’ Broadway credits include the role of Gavroche in Les Miserables, Chip in Beauty and the Beast, Little Jake in Annie Get Your Gun and Tiny Tim and the Young Scrooge in A Christmas Carol – the Musical at Madison Square Garden. He has performed in commercials for the Disney Channel, Chuck E. Cheese and others. In November 2004, Integrity Music and Sony Music released Jonas’ self-titled album, featuring the single “Dear God.” The album debuted in both the Christian and mainstream markets. Jonas is founder of the Nicholas Jonas Change for the Children Foundation, a nonprofit organization working to meet the needs of abused, homeless, and terminally ill children. He sings regularly in his church, Wyckoff (New Jersey) Assembly of God, where his father Paul Jonas is senior pastor.